This 150W Sunshine Solar Power Caravan & Motorhome Kit offers outstanding performance and great value for money. With this 150 Watt solar power kit you could expect to generate around 50 amps per day during the summer months supplementing the 12V leisure battery power in caravans, motorhomes, boats etc. This Sunshine Solar Power Caravan & Motorhome Kit includes our latest technology high efficient MPPT Charge Controller for maximum yield. 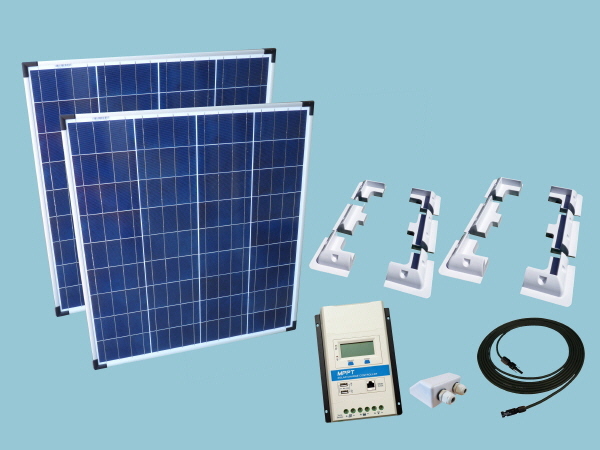 The solar panel mounts supplied with this kit give maximum fixing flexibilty e.g: you may wish to mount the solar panels together end to end using four corners and two side pieces or the solar panels can be mounted away from each other uses the eight corner pieces. Save Money..... Don't forget to add some Bostik-360 Fixing Adhesive at a reduced price for bonding the solar mounts and cable entry cover. Important note: Each solar panel needs a flat area of 790mm x 890mm these dimensions include the corner mounts supplied with the kit.